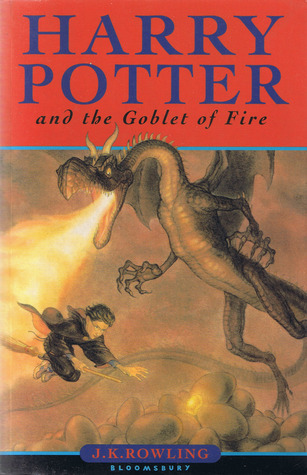 The Quidditch World Cup, Mad-Eye Moody, SPEW, The Triwizard Tournament, The Yule Ball, Rita Skeeter, the events after the final challenge… so much is jammed into the pages of Goblet of Fire that the Goblet of Fire itself doesn’t even make an appearance until over a third of the way in. Dark dealings start to make an appearance at the Quidditch World Cup, with the torture of a muggle family and the appearance of the Dark Mark. After that though, the Death Eaters keep a low profile as the Triwizard Tournament kicks off at Hogwarts. Students from the other Wizarding schools of Beauxbatons and Durmstrang arrive for the event, and Harry is mysteriously chosen as the fourth champion (no surprise there). Meanwhile Hermione is busily trying to convince the House Elves to rise up from their slavery and demand payment and holidays from their masters, an idea most House Elves are horrified by. Ron and Harry are rather embarrassed by her continual efforts to get them to join in with her SPEW (Society of the Promotion of Elfish Welfare) schemes, and while Dobby is pleased she is trying to help his fellow elves, Dobby’s friend Winky is very upset about finding herself a Free Elf. It’s a rather heart-wrenching part of the story! Of course, the third and final challenge doesn’t progress according to plan – Harry and Cedric are whisked off to a strange graveyard where Harry witnesses the return of He Who Must Not Be Named to the flesh. This scene, the ritual to revive Voldemort and the fight that follows is the stuff of nightmares and I seem to remember being totally blown away by it all on my first read. It hasn’t lost its impact – this is the perfect dramatic ending to the story and the beginning of a much darker time in the Wizarding world. At twice the length of the previous book The Goblet of Fire is no quick read, but I think I have found my new favourite. This is the last bastion of normality at Hogwarts, even though it’s hardly a normal year with the students from Beauxbatons and Durmstrang staying for the whole year. Things are still relatively normal and I think the “normal” Hogwarts happenings are some of my favourite details about this series. After this book, things start to take a definite dark turn. I recently saw The Goblet of Fire film on TV again and wow, I’d forgotten how many story elements were changed. They had to to fit the whole year’s worth into two hours forty minutes I suppose, but they really did leave out everything but the most basic of plotlines. Harry doesn’t spend any time at Privet Drive at all, but starts at the Burrow already. The entire SPEW movement was missing, as was all of Fred and George’s “Weasley’s Wizard Wheezes”. Major plot details were changed around but I still thought the film flowed reasonably well, even if it felt a little rushed at times. Not my favourite film of the series, though. I’m not sure if you’d want to be reading this particular one to the very small, but middle-sized kids and all other ages should love it. On with the series! I always forget about SPEW! God I hope I find the time to reread these soon..